Virtual reality is being used to train law enforcement officers for scenarios they may encounter out in the field, ranging from traffic stops to active shooter situations. A new facility incorporating a virtual reality simulator along with a physical training environment was introduced last month in Monmouth County, New Jersey. 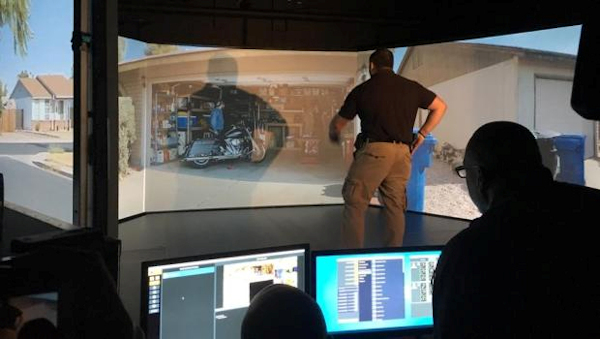 The facility is the first of its kind in the state and another step towards virtual reality becoming a more mainstream element in law enforcement training across the country. The facility is called STARS: Situational Training And Response Simulator, and is a joint initiative involving various agencies in Monmouth County. The location is divided into two parts. The first is a physical plant which places officers in a tangible environment using non-lethal training rounds, smoke, fire alarms, strobes, and other special effects. For the second, virtual portion of the training, they are using the VirTra V-300 simulator from a company called VirTra Systems Inc. This simulator has five screens, allowing trainees a 300-degree view of the situation. Scenarios are designed to replicate real-life events that officers may encounter in the field, ranging from domestic violence incidents to active shooter situations. The trainees are equipped with a variety of tools including training firearms that recoil and weigh the same as an authentic firearm would. The scenarios are pre-recorded using trained actors with approximately 10 to 15 different outcomes per scenario. An operator in the training room controls how the simulation unfolds based on the actions of the trainee. Crum also spoke about an electronic impulse device which can be used to deliver a mild shock to the trainee, although his agency hasn’t adopted that technology. “We have a device which introduces pain and stress,” said Scott Dilullo, federal law enforcement business development manager at VirTra Systems Inc. He explained to CBS News why pain and stress might be useful, even desirable, in a training situation. VirTra Systems’ VR and other training technology is currently used by more than 200 individual law enforcement agencies across 38 states. But it’s not the only company delving into the virtual reality business for law enforcement. Ethan Moeller, CEO of LEVRS Inc., is planning on rolling out virtual reality technology for law enforcement later this year. His firm has also been working with corrections agencies. Moeller currently offers a 360-degree virtual reality platform which requires the user to wear a headset. The environment they see projected inside is real and was previously filmed; while the user can look around in the virtual environment, he or she cannot move within it. The company has used the technology to film the environment where soon-to-be-released inmates will be living, allowing them to first see it through a virtual headset to help make their transition into the outside world go as smooth as possible. LEVRS has an ongoing partnership with the Pennsylvania Department of Corrections for this service. Moeller is also working on a computer graphics platform which uses a virtual reality headset paired with computer-generated imagery to create virtual scenarios and situations for law enforcement. That version uses the VIVE system to track hand and body movement so that users can move and walk within a realistic world. Like VirTra, an operator must be present to determine the outcome of the scenario. However, Moeller hopes that speech recognition software may be able to remove the need for an operator in the future, instead allowing the scenario to unfold naturally based on the verbal commands and actions of an officer. Various outcomes would be preprogrammed by a trainer. “The great thing about virtual reality is that it brings you closer to a real-life experience than anything else that I’ve ever at least experienced. And because of that, when you train you want to get that environment as real as possible and that’s what VR does,” Moeller said.